WOW! If you do not have an account at Purple Lounge Casino - An awesome Microgaming powered Casino, then now is the time to get yours! This casino has decided to do something totally different than the others and let YOU, the player, decide what kind of bonus you would like. Do they accept US players??!! 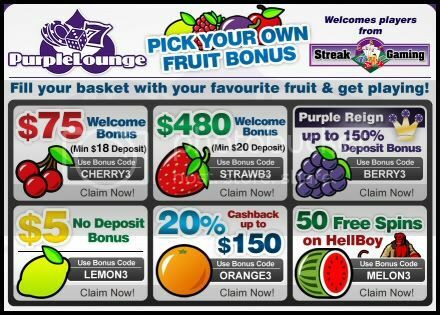 When you are on the landing page, http://www.purple-lounge.com/en/aff...eakCasinoFruitsPromotion.mth?btag=a_945b_1192 If you click on the promotion of your choice, a pop-up will appear with directions on how to claim the promotion. Great offer for new players to Purple Lounge! This is still a good offer everyone! !